In 510 BC a man named Cleisthenes (KLICE-then-eez), who was an aristocrat (a rich, powerful man) in Athens, invented another new type of government, the democracy. Cleisthenes, like other aristocrats, wanted to get more power. But tyrants had gotten unpopular in Athens. Cleisthenes decided to give even more power to poor people. He organized a new way of making political decisions. Every Athenian man would have one vote, and they would all meet and vote on what to do. The big meeting was called the Assembly. They didn’t really mean everybody could vote. Women couldn’t vote, and enslaved people couldn’t vote, and immigrants couldn’t vote, and children couldn’t vote. So really, only about an eighth of the people living in Athens could vote. Basically it was only soldiers and veterans who could vote. And Athens was getting a lot of its money by forcing enslaved people to work in dangerous silver mines, digging up silver for Athens to use as money. Athenian silver coin with Athena’s owl on it. But even all of these voting men couldn’t meet every day; they had to work. So there was also a smaller council of 500 men, who were chosen by a lottery, and changed every year. Seems like Cleisthenes AND the other aristocrats would be out of power? But he arranged the voting so that his family, the Alcmaeonids (alk-MEE-oh-nids), would have more votes than anyone else. In 490 BC the Persians attacked Athens. Everybody was very frightened, because the Persians were great fighters. Some people thought Athens should go back to the old system of government, the oligarchy, in case democracy didn’t work well enough. They thought it would take too long to make decisions in a democracy. But they took a vote, and the Assembly decided to keep their democracy anyway. 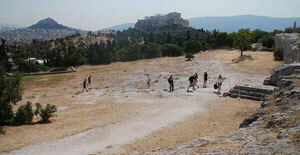 All the men in Athens marched out to meet the Persians at Marathon. They thought they would lose. But the Athenians fought in the new way, with the wall of shields, and the Persians were still running and yelling. So the Athenians won! In 480 BC the Persians, with their king Xerxes (ZERK-sees) attacked again. This time most of the cities in Greece banded together and formed a league to fight the Persians. They lost their first battle, at Thermopylae (therm-AH-pill-aye), but they won after that, at Salamis and again at Plataea (plah-TAY-ah). Again the Persians went home defeated. (More on the Persian Wars). The Athenians convinced the other Greek cities that they needed to keep the strong Greek navy together in case the Persians came back again. At first everyone thought this was a good idea, except the Spartans, who refused. Then the Athenians said to the other cities, “Don’t bother sending ships and men for the navy anymore; that is too hard. Just send money to Athens, and we will build ships and defend you against the Persians.” So a lot of cities did that. Empire-building was the hip thing – everyone was doing it. But the Persians did not come back. After a while, some of the cities said, “We don’t want to send any more money to Athens. We don’t think the Persians are going to come back anymore.” But the Athenians used their big navy to MAKE the other cities keep sending money. When the island of Naxos refused, the Athenians destroyed the walls of the Naxians’ main city. The Athenians also spent some of the money on their own city. No Athenians had to pay taxes anymore. They had so many slaves, many Athenians didn’t even have to work anymore. The Athenians used the money from the other cities to build great temples like the Parthenon. The other cities in Greece were angry. They asked the Spartans to help stop the Athenians. Some cities took sides with Athens, others with Sparta. There was a big war, from 431 BC to 404 BC (almost thirty years!). This is called the Peloponnesian War. But finally, with the help of the Persians, the Spartans won and the Athenians lost. (more on the Peloponnesian War). By this time, all of Greece had pretty much been wrecked, and the Classical period was over. Athenian Democracy, by A.H.M. Jones (reprinted 1986). One of the great social historians of the 20th century, though this isn’t easy reading. Cite this page: Carr, K.E. Classical Greek history. Quatr.us Study Guides, July 7, 2017. Web. April 18, 2019. This is sooo interesting… it is so amazing what happened before we were born. A long time before you were born!